So I finally graduated. My thesis took around 13 months to complete, but was graded with an 8.5/10, which is high enough to forget about how long it took. The thesis is available from the TU/e library website. 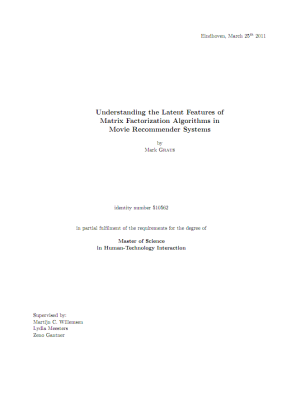 It discusses the study I performed on the similarities between an algorithm called matrix factorization that predicts ratings for movies, based on ratings that users have given in the past, and psychological ways to describe preferences. To make this comparison I deployed an online study to investigate how people perceive similarities in movies.